We will not ship to a PO box, we must have a physical address. The 4000 is so compact and versatile that it is widely used, with excellent results, by people around the world. Just like them, you can have a supply of fresh, homemade distilled water no matter where you are. 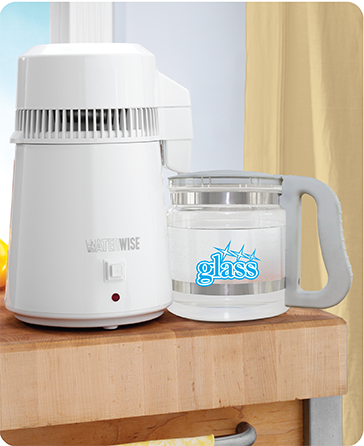 Simply fill the stainless steel boiler with tap water, press the start button, and soon you'll be enjoying the most deliciously pure and refreshing water you've ever had! As with all Waterwise distillers, the 4000 combines steam distillation with carbon post filtration, resulting in optimum water purity. One aspect of the distillation process is that all minerals get removed from the water; both the bad and the good. Adding Healthmasters Aqua Trace (click here) to the water after distillation is a fantastic way to correct this deficiency and add back those essential minerals. To re-mineralize your water add 20-40 drops per gallon of water. 40 drops will provide 250mg of magnesium, which most individuals are woefully deficient in. *This product is not eligible for free shipping offer.